Columbia KCS 9463. Bob Dylan's Greatest Hits. 1967 LP. Tracks are Rainy Day Woman #12 35, Blowin' in the Wind, The Times They Are a Changin', It Ain't Me Babe, Like a Rolling Stone, Mr. Tambourine Man, Subterranean Homesick Blues, I Want You, Positively the Street, Just Like a Woman. 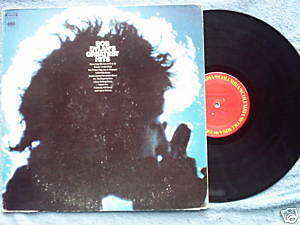 Dylan's first hits album collected from his first nine albums. Cover photo by Roland Scherman. Vinyl is VG/VG; cover is VG with seam splitting and corner wear.